This article is about the weekly publication of the Centers for Disease Control and Prevention. For other uses of the term "morbidity and mortality", see morbidity and mortality (disambiguation). MMWR has its roots in the establishment of the Public Health Service (PHS). On January 3, 1896, the Public Health Service began publishing Public Health Reports. Morbidity and mortality statistics were published in Public Health Reports until January 20, 1950, when they were transferred to a new publication of the PHS National Office of Vital Statistics called the Weekly Morbidity Report. In 1952, NOVS changed the name of this publication to the Morbidity and Mortality Weekly Report, which continues through the current day (2018). On the other hand there have been articles that have been controversial, such as a report stating a low concerns for risks of elevated blood levels of lead in Washington, DC (April 2004). The article was notable and later criticized  for not emphasizing the risks, and now is available together with two amending "notices to the readers" by CDC from 2010. Lead is well known to have toxic effects, especially for embryos and small children. Even in small doses, lead poisoning may lead to e.g. permanent intelligence deficiencies and concentration difficulties. On March 30, 2004, an "MMWR dispatch", Blood Lead Levels in Residents of Homes with Elevated Lead in Tap Water --- District of Columbia, 2004 was made available on the MMWR web site. It was then published by CDC as "MMWR Weekly, April 2, 2004 / 53(12);268-270". Its principal author was Mary Jean Brown, who was the head of the lead poisoning branch of CDC. The report "summarizes the results of the preliminary investigations, which indicated that the elevated water lead levels might have contributed to a small increase in blood lead levels (BLLs)". The report describes the background, and the various kinds of blood tests it employed, and explicitly states: "All blood tests were used in this analysis." There is no mention at all of any test results not being available, not even in the caveat section, where other potential sources of error are discussed. The report concludes that the high amounts of lead in the drinking water may have led to a slight rise of the blood levels; however, it claimed that "no children were identified with BLLs >10µg/dL, even in homes with the highest water lead levels". It notes that 10 µg/dL was "CDC's BLL of concern for children" since 1991. The report also claimed that the average levels were sinking with time. On the other hand, the report found some cases of children with BLLs > 5 µg/dL; and also stated that actually "no safe BLL has been identified". Therefore, the report recommends that efforts should be made to eliminate lead in children's blood entirely, and in particular, that the authorities should take measures to ensure that the amount of lead in drinking water always should be less than 15 PPM. The report does not in itself provide any recommendations to the ordinary Washington DC inhabitants, but it notes that the District of Columbia Department of Health has "recommended that young children and pregnant and breast-feeding women refrain from drinking unfiltered tap water". The report later was strongly criticized, by Marc Edwards, some news media, and ultimately by the United States House Committee on Science, Space and Technology. ^ Morbidity and Mortality Weekly Report: About Us, Centers for Disease Control and Prevention. Retrieved July 24, 2009. ^ Morbidity and Mortality Weekly Report Staff, Centers for Disease Control and Prevention. Retrieved February 1, 2019. ^ "Public health dispatch: multistate outbreak of hepatitis A among young adult concert attendees—United States, 2003". MMWR Morb Mortal Wkly Rep. 52 (35): 844–5. 5 September 2003. PMID 12966361. ^ O' Neil, John. "VITAL SIGNS: HAZARDS; Outbreak on the Concert Circuit", The New York Times, September 9, 2003. Retrieved July 24, 2009. ^ via Associated Press. "NATIONAL BRIEFING | SCIENCE AND HEALTH; Count Of 'choking Game' Fatalities", The New York Times, February 15, 2008. Retrieved July 24, 2009. ^ Bakalar, Nicholas. "Northwest Fishery Posts Highest Fatality Rate", The New York Times, May 13, 2008. Retrieved July 24, 2009. ^ Bakalar, Nicholas. "Smoking Ban Improves a City's Health", The New York Times, January 12, 2009. ^ "Swine Influenza A (H1N1) Infection in Two Children — Southern California, March—April 2009". MMWR Morb Mortal Wkly Rep. 58 (15): 400–2. 24 April 2009. PMID 19390508. ^ a b c "Blood Lead Levels in Residents of Homes with Elevated Lead in Tap Water — District of Columbia, 2004". MMWR Morb Mortal Wkly Rep. 53 (12): 268–270. 2 April 2004. PMID 15057194. ^ a b c Leonnig, Carol D. (May 20, 2010). "CDC mislead District residents about lead levels in water, House probe finds". The Washington Post. Washington, DC. Retrieved June 22, 2011. ^ "First report of AIDS" (PDF). MMWR Morb Mortal Wkly Rep. 50 (21): 429. 1 June 2001. PMID 11478306. Reprint of 5 June 1981 report. 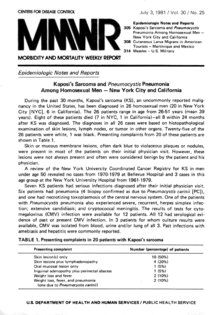 ^ "Pneumocystis pneumonia—Los Angeles. 1981". MMWR Morb Mortal Wkly Rep. 45 (34): 729–733. 30 August 1996. PMID 8778581. As PDF Reprint of the June 4, 1981 report. ^ Home-Douglas, Pierre (November 2004). "The Water Guy". Prism. American Society for Engineering Education. 14 (3). Retrieved June 15, 2011. ^ Levin, Josh (October 18, 2002). "Plumbing the Depths: the EPA finds too much lead in D.C. tap water". Washington City Paper. Washington, DC. ^ Nakamura, David (January 31, 2004). "Water in D.C. Exceeds EPA Lead Limit". Washington Post. Washington, DC. p. A01. ^ a b c d Renner, Rebecca (April 10, 2009). "Health agency covered up lead harm". Salon.com. Salon Media Group. Retrieved June 15, 2011. ^ a b c Leonnig, Carol D. (August 4, 2009). "D.C., U.S. Underreported Number of Kids With High Lead Levels by More Than Half". Washington Post. Washington, DC. Retrieved June 22, 2011.